Eight suspense novels by female writers of the 1940s & 50s. I can’t help thinking that authors like Gillian Flynn, Laura ­Lippman, Megan Abbott and Paula Hawkins have learned a thing or two from such foremothers. Like their predecessors, these contemporary writers are all the more unsettling because they hit just close enough to home to infect us with personal anxiety. The question is whether their works will stand the test of time as well as Sarah Weinman’s irresistible octet of suspense and surprise. These authors may have also made more money from their writing than did their male counterparts, at least when their work appeared in magazine form. But changing social mores ...and the vicissitudes of publishing gradually pushed them out of the spotlight. Now, thanks to Weinman and the Library of America, they are back in the conversation about the best American crime writers. This two-volume anthology provides a taste of the suspense genre of American fiction from our grandparents’ and parents’ eras, and while some of it is impressive for its energy and literate writing, it’s more of a curiosity piece in these days of the Lee Child-Patricia Cornwell school of blood, guts and gore. 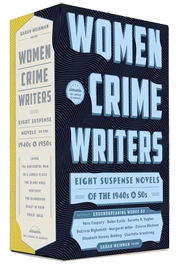 What did you think of Women Crime Writers: Eight Suspense Novels of the 1940s & 1950s?